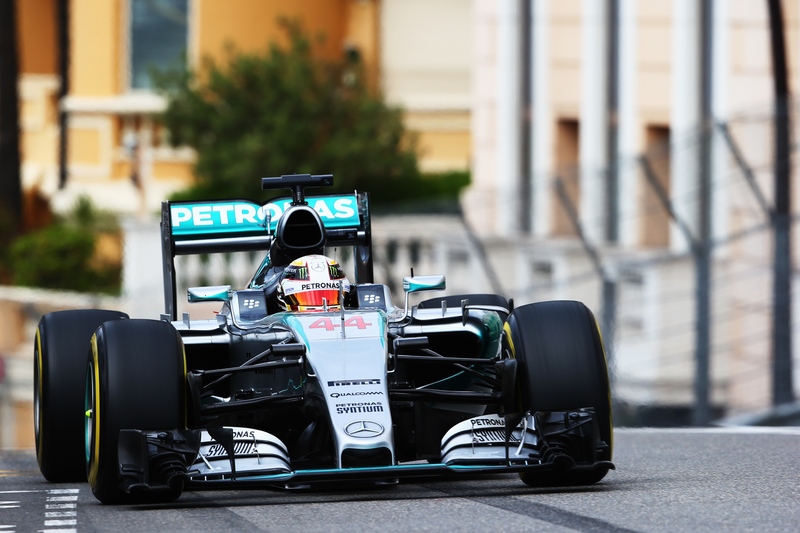 Lewis Hamilton has qualified on pole position for tomorrow’s 2015 Monaco Grand Prix. The British driver has never stated the race from the front of the grid, but will do so tomorrow ahead of team-mate Nico Rosberg and Ferrari’s Sebastian Vettel. Rain threatened to intervene in the final 12 minute session, but it wasn’t to be, with Hamilton taking pole after Rosberg bailed out of his final run. Hamilton’s performance means that Mercedes have been on pole for the last 4 years in Monaco, with Michael Schumacher and Nico Rosberg previously qualifying their in 2012, 2013 and 2014. After a day-off on Friday, the drivers returned to the circuit which was in much better conditions than those they saw on Thursday. Wet conditions had been the order of the day in the first two free practice sessions, but third practice was run in dry conditions earlier on in the day on Saturday before qualifying began. Sebastian Vettel had topped the final practice session by 2 tenths ahead of Nico Rosberg. Drivers were queuing at the end of the pit-lane for the start of Q1, with Will Stevens leading the train out onto the circuit. The first qualifying session is frequently the most frustrating session of the whole weekend for the drivers, with 18 cars trying to give themselves clear air on the tightest track on the calendar. This was demonstrated within the first 2 minutes as 4 cars backed themselves up through Tabac. Max Verstappen, who had damaged his Toro Rosso in practice 3, was straight out onto the circuit, with the Dutchman briefly holding the top spot before the front-runners emerged. Sebastian Vettel was quick to displace him in the Ferrari before Lewis Hamilton and Nico Rosberg pipped him to get 1st and 2nd by almost a second. Rosberg completed another lap soon after that put him in front by 6 hundredths of a second. Lotus were the first team to venture out onto the faster super-soft tyre compound, with Maldonado vaulting up to 4th place. Sergio Perez soon followed in the Force india to go 6th. Grosjean was almost bump-drafted by Fernando Alonso through Rascasse as the Frenchman searched for clear air whilst Alonso completed a hot-lap. 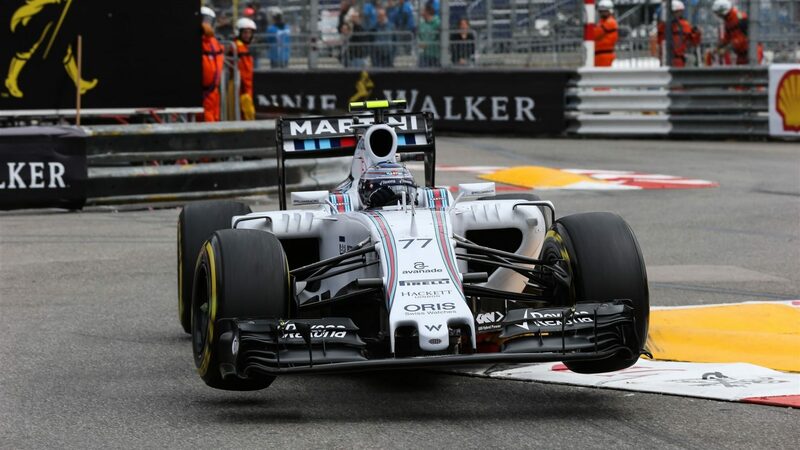 As the session reached it’s closing stages, Felipe massa and Valtteri bottas had been in the drop-zone for Williams. A late lap on the super-softs was enough to put Massa in a lowly 11th. Bottas was on a lap to try and lift himself out of elimination, but heavy traffic denied him the chance. He would shockingly be eliminated in 17th, along with the two Sauber’s of Felipe Nasr and Marcus Ericsson and the Manor’s of Will Stevens and Roberto Merhi. The temperature was dropping as the drivers started the second session of qualifying. 15 drivers were now on track, meaning that clear air would be a little less infrequent than before. Sebastian Vettel was out instantaneously on the super-soft tyre. In the cooler temperatures, the drivers were struggling for grip, so the plan for them was to have 2 warm-up laps before a flying timed lap. Vettel took P1 ahead of team-mate Raikkonen. 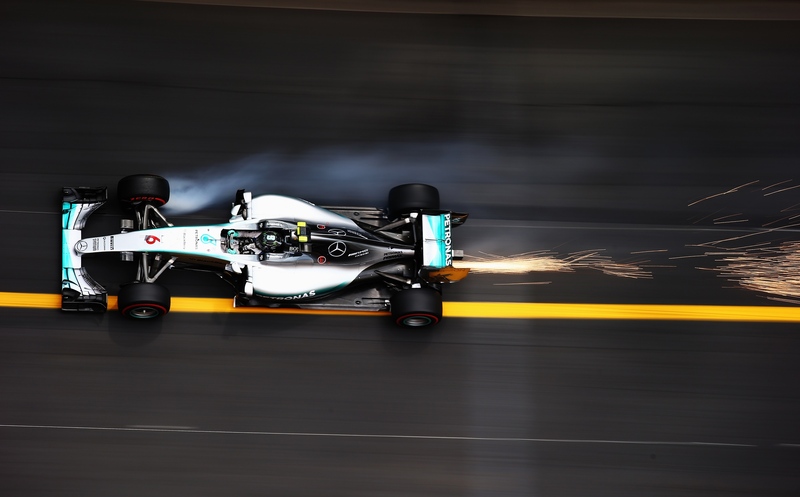 Rosberg soon came through to go fastest by 7 tenths, with Hamilton matching Vettel’s time down to the thousandth. Both McLaren’s had made it through into the second session, with the team hoping that this weekend could see the first world championship points this year. This will be difficult for Fernando Alonso to achieve tomorrow after he pulled his McLaren to the inside of Saint Devote with a mechanical issue. He will start 15th. Jenson Button was facing difficulties too. Nico Rosberg went wide at Saint Devote after a massive lock-up for the #6 Silver Arrow, this bought out the yellow flags which meant that Jenson Button had to give up 4 tenths through the corner which would prove to be insurmountable during the rest of the lap. He would be eliminated in 12th place behind Grosjean and ahead of Hulkenberg, Massa and Alonso. Small drops of rain started to fall in the harbour ahead of the final 12 minutes of qualifying to decide the pole-sitter for the 2015 Monaco Grand Prix. Lewis Hamilton was first in line at the end of the pit-lane ahead of his team-mate for the start of the Grand Prix as everybody piled out onto the track to try and beat the rain. Some drivers elected to take an extra warm-up lap, others didn’t. The Mercedes duo elected to, but Force India and Lotus didn’t as Maldonado breifly took provisional pole early in the session. Lewis Hamilton’s flying lap was a scorching 1’15.304; 2 seconds quicker than Maldonado but more importantly, a tenth quicker than Rosberg. Sebastian Vettel was 4 tenths down on Rosberg in 3rd. First blood to Hamilton in the first run of the session, with the rain seemingly holding off. All of the drivers, with the exception of Sergio Perez who had run out of new super-soft tyres, went out for a second and final run in Q3. The drivers were still having an extra lap to warm up the tyres. Hamilton was on a mighty lap which put him on a 1’15.098. There would be no challenge either, as Rosberg announced halfway through his final lap that would be pitting due to an awful first sector. This ensured that Lewis Hamilton would take his first Formula One pole position in Monaco. He’d qualified on pole here 9 years ago in GP2, but he had yet to do so in Formula One until now. Sebastian Vettel couldn’t improve from third and will start behind the two Mercedes drivers. Daniel Ricciardo and Daniil Kvyat took 4th and 5th after superb performances for the Red Bull team-mates. Kimi Raikkonen had been in 5th until the last moments where he was pipped by Kvyat. Despite not making a final run, Sergio Perez took 7th for Force India behind Raikkonen. Toro Rosso drivers Carlos Sainz and Max Verstappen sandwiched Pastor Maldonado in 8th and 10th to complete the top 10 on the grid.